The LifeWays® Principles are listed below. Click here for a printable version. Young children thrive in the presence of parents and other devoted caregivers who enjoy life and caring for children. They learn primarily through imitation/empathy and, therefore, need to be cared for by people with integrity and warmth who are worthy of being imitated. This is the foundation for learning and healthy development. Having consistent caregivers, especially from birth to three years old and, preferably, up to primary school age, is essential for establishing a sense of trust and well-being. Children need relationship with people of all ages. Infants and toddlers thrive in family-style blended-age care, while older children see nurturing modeled by the adults and experience their own place in the continuum of growing up. Children of all ages can both give and receive special blessing when in the company of elders and youth who enjoy children. Each person is uniquely valuable, gifted with purpose and worthy of respect throughout all phases of his or her life’s journey. Human relationship and activity are the essential tools for teaching the young child all foundational skills for life. Infants and toddlers develop most healthily when allowed to have freedom of movement in a safe environment. For three- to six-year-olds, creative play, not technology or early academics, forms the best foundation for school work and for life-long learning. In infancy and early childhood, daily life experience is the “curriculum.” The child’s relationships to the caregivers and to the environment are the two most important aspects through which the child can experience healthy life rhythms/routines. 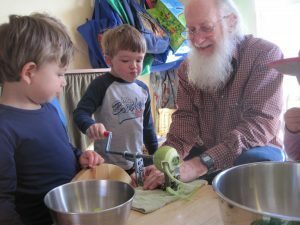 These include the “nurturing arts” of rest and play, regular meal times, exploring nature, practical/domestic activities, social creativity, music and simple artistic activities. Young children thrive in a home or home-like environment that offers beauty, comfort and security, and connection to the living world of nature. Healthy sense development is fostered when most of their clothing and playthings are of non-synthetic materials and their toys allow for open-ended, imaginative play. Childhood is a valid and authentic time unto itself and not just a preparation for schooling. Skipping or hurrying developmental phases can undermine a child’s healthy and balanced development. Parents of young children need and deserve support in their path of parenting—from professionals, family, and one another. They thrive in a setting where they are loved, respected and helped to feel love and understanding for their children. Caregivers also have an intrinsic purpose and need to be recognized and appropriately compensated for the value of their work. They need an environment where they can create an atmosphere of “home,” build true relationship to the children, and feel autonomous and appreciated.